202 pages | 38 B/W Illus. 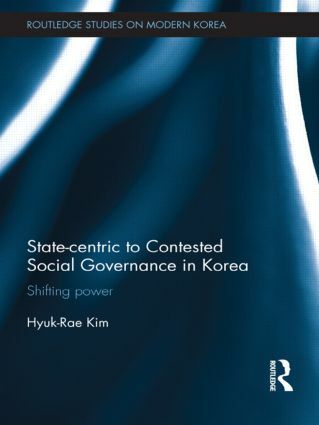 In this interdisciplinary study of governance, Hyuk-Rae Kim traces how civil society and NGOs have evolved over time, how they differ in motivation from their Western counterparts, and the role civil society NGOs have played in consolidating democracy as the governance system in Korea changes from a state-centric to a contested one. This book presents civil society's rise in Korea through in-depth analyses of today's most pressing issues, in order to chart the shifting role of a formerly state-centric to a contested governance system in modern Korea. With detailed case studies and policy discussions, this book explores the role of NGOs in campaigning for political reform and the eradication of political corruption; the provision of public goods and services; challenging the government’s policies on migration; tackling the issue of North Korean refugees and human rights; and the provision of regional environmental governance. These case studies demonstrate that the state is no longer the sole guardian and provider of public institutions and goods and underline the growing role of civil society in Korea. Both a study of contested governance and an exploration of contemporary Korean society, this book will be of imminent interest to students and scholars alike of Korean politics, East Asian politics, governance, and civil society. "This is a well-written book with well-structured chapters and well-supported examples and logic… Anyone interested in civil society, Korean politics or even the issues of migrants or the question of North Korean refugees would find this book very helpful." Hyuk-Rae Kim is Professor of Korean Studies in the Graduate School of International Studies at Yonsei University, Korea.